Click on this image to access photo galleries from Fall Frontiers poster exhibitions. Fall Frontiers in Undergraduate Research provides an opportunity for UConn’s talented undergraduate researchers to share their work with the university community. Given the growth of student participation in the Frontiers in Undergraduate Research Poster Exhibition that has been held each spring since 1998, in October 2013 the Office of Undergraduate Research began hosting a second exhibition so as to allow interested students to share their work during the fall. 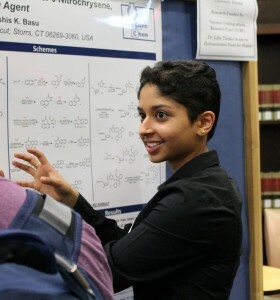 The increasing number of students who are conducting research supported by OUR award programs such as UConn IDEA, HRP, SURF, and SHARE marks the need for an additional venue to highlight the work of student researchers and their dedicated faculty mentors. View or download the Fall 2018 Program, Fall 2017 Program, Fall 2016 Program, Fall 2015 Program, Fall 2014 Program, or the Fall 2013 Program with all student projects listed. The 7th Annual Fall Frontiers is scheduled for Wednesday, October 30, 2019. Many thanks to the 68 students who presented their research and creative projects at the 6th Annual Fall Frontiers in October 2018. View Fall Frontiers event photos here. The Fall Frontiers online application is now closed. Applications to present in Fall 2019 will open in September 2019. What will be asked in the online application? This application outline (PDF) outlines the information you will need to provide. Note that no abstract is required. OUR staff will confirm your participation via email once we review your application. All presentations will be set up on poster boards in the Wilbur Cross Building’s South Reading Room. Poster space is a 46 inch (vertical) by 70 inch (horizontal) display. There is additional space (approximately 24 inches high) below the poster stand if extra space is needed. The poster boards will be covered with navy blue paper as a background for your display. We will provide pins and staplers for you to mount your posters. Photos from past events illustrate how different students have made use of the available display space. As a Frontiers participant you will be representing the University of Connecticut. It is expected that you respect that privilege and dress in professional attire for your presentation. You agree to remove your work at the conclusion of the event Wednesday evening at 7 p.m., and not before. The Office of Undergraduate Research cannot keep any posters for students, so if you cannot be there to remove your own work, please have someone remove it for you or it will be thrown out. Poster templates are available from the College of Agriculture, Health and Natural Resources Office of Communications and UConn Brand Standards. Check with your faculty advisor as individual departments often have specific templates they prefer. You can download official UConn logos here. The Office of Undergraduate Research is not able to fund the cost of poster printing for student presenters. You can get your posted printed at the UConn Design & Document Production Center, located near parking services. You should plan to speak with them early about poster size and paper options, finishings, and accepted file types.